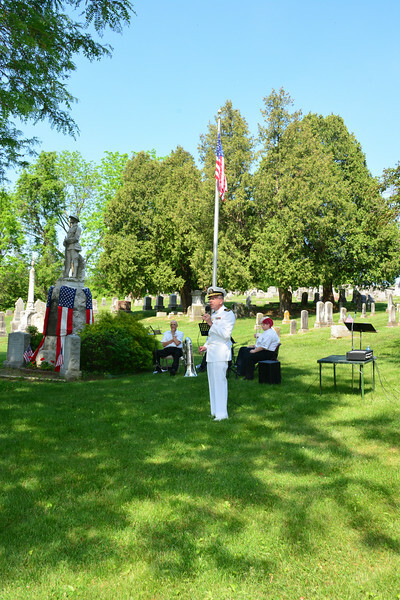 Rabbi Seth Phillips, a retired Navy Chaplain, was the keynote speaker at the annual Cedar Union Church Memorial Day remembrance held each year on the Sunday prior to Memorial Day. The ceremony is held in the cemetery adjacent to the church at the statue of a World War I soldier erected in memory of those who had fallen as well as served during WWI. Chaplain Phillips, a retired Lt. Commander, talked of his service as a chaplain serving all faiths in uniform including Christians, Jews, Mulsims, Buddists and even Atheist. Rabbi Phillips message was one of caring and nuturing of our citizen soldiers in harms way and how the chaplain corps is there to proved comfort, support and a listening ear.